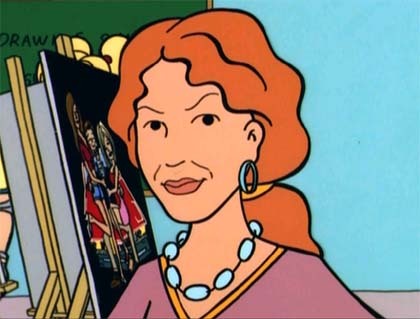 Claire Defoe is Lawndale High's resident Art teacher. Claire Defoe is characteristically very relaxed and patient, more in tune to art than anything else. She was rarely seen actually creating any art of her own (the only example on-screen was her making something out of yarn during a teacher's convention in The F Word), but she did delight in nurturing the talents of others, particularly Jane Lane ("Arts 'N Crass"). Jane appears fond of Defoe as well, helping her with protest signs in "Lucky Strike" even though she'd just stated she'd tell any teacher asking her help "where to stick it". She is generally patient, albeit weary, in the face of students like Brittany Taylor who are quite bad at art. Students who are good at it can get her ire: in "Arts 'N Crass", both Upchuck and Jane produced good work, but Claire was openly irritated that Upchuck had ignoring the contest guidelines and dismayed when she thought Jane was mocking bulimics. When she worked out Daria had collaborated on Jane's painting and had intended a message, she challenged Daria into explaining and justifying her artistic choices and admitting to the collaboration. "The Daria Diaries" shows a guideline for how the class should behave on a field trip to the County Museum of Modern Art, showing she's well aware of what her class is like - her guidelines include to "at least look" like they're paying attention, for Kevin Thompson not to shoplift, that no one is to snicker at the nudes or look for dinosaurs ("that's another museum"), and that if they're puzzled by art they can cover this up by saying "how postmodern!". She also advises "DO jump up and down on the front steps like Rocky. You're only young once." Claire and a student, in "The Daria Database"
The book "The Daria Database" shows some of her art: a macrame plant holder. She plans to start her own mail-order business selling them, at some vague point in the future when she's 'got it together'. Defoe has her personal history fleshed out in "Diaries" and "Database". From the books it is revealed that she resented to have to choose between "Arts" and "Crafts" and that she makes wind chimes in her spare time (which Anthony DeMartino can't stand hearing and throws in the bin). It is also revealed that she owns a studio apartment that's been occupied by freeloading ex-college suitemates, who she doesn't have the heart to throw out (a theme that has been explored in some fanfiction stories); as a result, she keeps a sleeping bag in the school staff room so she can stay there and washes with "homemade soap at truck-stop showers". It has been theorized by fans that Defoe could have an hippie past. Defoe doesn't appear in a lot of fanfiction, but there are some that give her highlighted roles. In Richard Lobinske's Falling Into College series, she mentors Jane when she returns to Lawndale High as her assistant before leaving for college. Later in the series, she is appointed Principal when Ms. Li is arrested for grade-fixing. In Wouter's story "Art-I-Fact" she's shown to be still teaching in her sixties and is a big instigator in having Jane come in to replace her. Apparently having never forgotten her most gifted student. 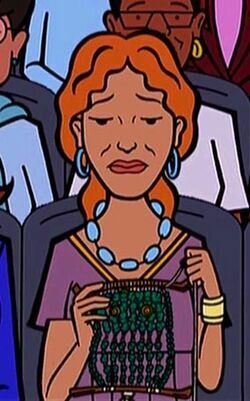 The spelling of Defoe's name is given in the Daria books. "DeFoe" is a mistake sometimes seen in fanfiction and posts. This page was last edited on 4 February 2014, at 08:11.